It was 1988, the movie Rain Man was a hit, the Dow Jones Industrial hovered around 2,000, and George Herbert Walker Bush was elected president. 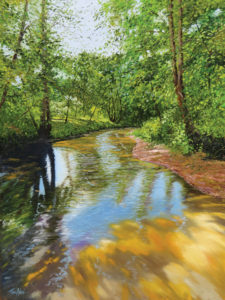 Oh, and I became an artist, moved to Fauquier County, and started selling my paintings. Becoming a working artist was my second career. I was in my early 30s and had recently moved back east from California, where I had been the national sales manager for a large automotive suspension company. This was after more than ten years in the performance automotive industry which, quite frankly, had begun draining my soul. It wasn’t the business, it was me. I needed a change. I yearned for something more…creative. While I’m a self-taught artist, art and creativity had been a principle hobby throughout my youth into adulthood. I’ve actually called it my salvation. A pencil, camera, scale model building, and design have never been far from reach. Thirty years later, I look back at this milestone with a pat on my old back. So happy that I had the foresight as a younger man to go for it. To remind myself that this is the actual play, not the rehearsal. Perhaps the reminder had been my father, who passed away in 1979, when we were both too young, and who had already been gone almost a decade. I was left to learn on my own that life may bring you opportunity, but you must bring to that life the actions, decisions, and intentions it needs to make your life whole. So, I decided to become an artist. I took action and intended on being successful. It wasn’t easy, but it was satisfying because I had re-entered an inspiring life of self-expression and creativity, where my brain and hands would work as a team. Rectortown and becoming a resident of Fauquier County. Smack dab in the middle of land known for horses and hounds, the Piedmont was a Godsend for these eyes. It’s scenic beauty still delivers the same sense of place it did all those years ago. 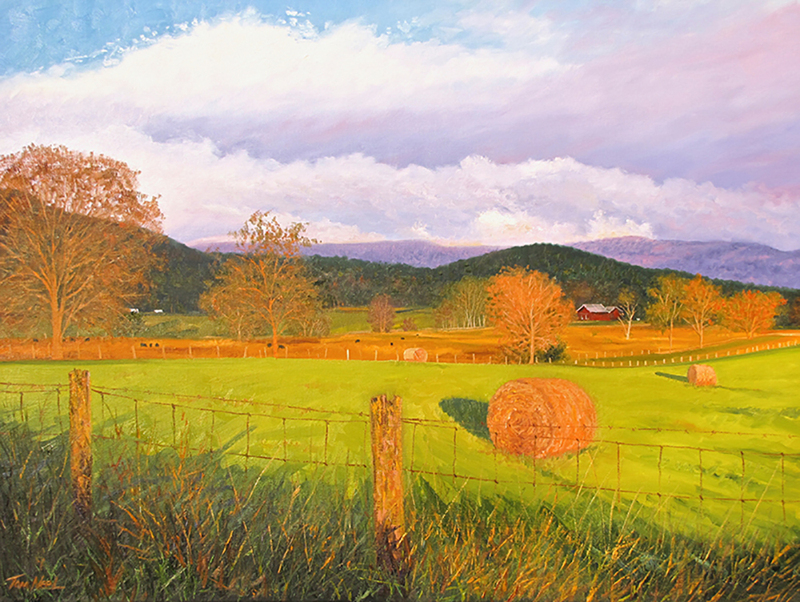 There’s a timelessness about the Piedmont that continues to captivate and excite me artistically. Fiery sunrises and sunsets, verdant greens of every value and hue, reflective streams and brooks, and mountains so blue. The wildlife here is amazing as well. When you can see a red fox, a bald eagle, a red tailed hawk, a purple finch, and a white tailed deer, all in the same day, hey, life as an artist is pretty good. So, while 1988 and 1989 were very good years for our economy, 1990 was not. The gallery was doing great, as was my blossoming art career. But 1990 brought a massive construction project in the way of a new parking garage to Leesburg that, ironically, wiped out downtown parking in the process. In July, we entered a recession, then we entered the Gulf War in August, and, the final nail, a government shutdown in October. Things were not looking good. Ah, remember, good intentions are powerful medicine. Almost simultaneously, Linda and I were eagerly asked to come work for the country’s then-largest fine art publishing company, directing their nearly $2-million gallery and becoming part of the company’s management team. Within months, not only did this happen, but in a blissful twist, our best gallery customer in Virginia decided to buy Leesburg Gallery. 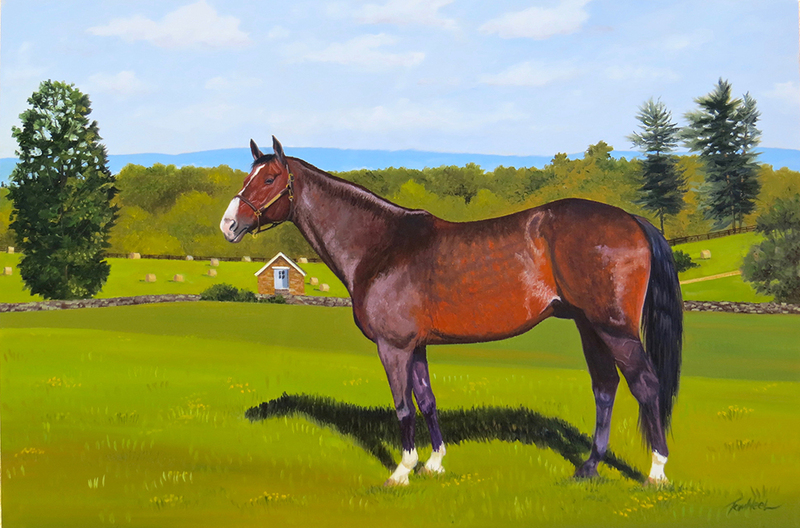 You have to understand now, we would be spending a lot of time in Connecticut, but while I was employed, I was still encouraged to paint. But now my day-to-day interactions were with some of the best nationally known and most successful artists in the country. A big part of my job was to visit with them, be in their studios, take them to dinner, and help them with business. We became friends and understood each other. As an artist, it was like being in an airport and hitting the people mover. Suddenly, things were moving much faster with far less effort, respectively. The best advice was at my fingertips. My art started gaining national exposure, and the company gallery we were also directing was doing great. So, of course, it made perfect sense to do what we did — quit. In May of 1994, we both walked away from our six-figure salaries to pursue my full-time career as an artist. Of course, there’s more to this story. But in short, we had a home in Virginia and it was time to go home and be a full-time, self-employed artist. That was 24 years, several additional wars, shutdowns, and recessions — including the big one–ago, and fortunately, my artistic self is still intact. Thirty years has its summits, peaks that give you a more favorable perspective of the valleys one must experience with any career and business covering three decades. One of the most rewarding parts of my business was choosing to be commissioned as an artist, to focus on customer service and allow my clients to take me onto paths I might not otherwise explore. This also allowed me to experience the celebratory feelings of others. When I paint a painting celebrating a person’s retirement after 50 years, or a couple’s 45th wedding anniversary, I am, quite frankly, honored. Then there are also those wonderful relationships and friendships that blossom out of such requests. As an example, not only was I commissioned by renowned Chef Patrick O’Connell to create the celebratory painting for the 30th Anniversary of The Inn at Little Washington (10 years ago), I was asked to do so again last year for the upcoming 40th anniversary this year. I cherish our relationship, as we have shared numerous creative collaborations over the years, including the treat box given to each dinner guest, and so many more. Other relationships are born of philanthropy. As an example, working with golf legend Jack Nicklaus and his lovely wife Barbara over the years has allowed my art to raise tens of thousands of much needed dollars for their Nicklaus Children’s Health Care Foundation. But most of the paintings I paint are simply a celebration of life in the Piedmont. My paintings are of country life, the polar opposite of the six o’clock news. Peace and quiet. So quiet you can actually hear yourself think, or more importantly, hear what urban life drowns out. The distant bird calling, the first sound of peepers in the spring, a babbling brook, or the sound of the wings of geese flying overhead. I’m always tickled when one of my paintings of this beautiful region makes its way to far away states like Oklahoma, or even far away countries like Greece. These are life-enriching experiences, valuable in ways beyond normal compensation for one’s talents. Fortunately, there have been wonderful lessons learned along the way. Allow me to share a few. An investment counselor once asked me, “When do you see yourself retiring?” My answer, “Retire? I already do what people when they retire.” In short, find something you love. And it won’t be work. Also, you know that old expression, “starving artist”? We never have. Art has been our passion, but for Linda and me, it has also been our business. We treat it and our collectors with respect. In that light, customer service and establishing meaningful relationships have been as important as any movement of my paint brush on canvas. So, the past 30 years have been magical ones of creative expression, low stress, and happiness. It’s not too much to ask of your life, and to every young person I say just three things: don’t smoke, it will ruin your life; be passionate with your intentions, and let happiness guide you. That doesn’t mean you don’t have to apply yourself to your goals. It just means find goals worth pursuing passionately. Oh yes, and live in a region like this, one that fuels your soul, one that beckons you to do as much for it as it does for you, Live an artful life!